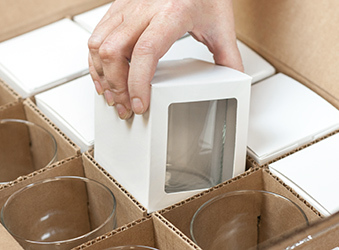 Our White Straight Sided Tumbler Boxes custom design securely encloses our Straight Sided Tumbler Jars. Each box is constructed from heavyweight paper board and "pops" into shape in seconds. They are 100% recyclable and a great option for packaging your finished candles as gifts or for retail. The these boxes are easy to label and customize with your own design. Each box is constructed from eco-friendly paperboard and "pops" into shape in seconds. The custom box design securely encloses the straight sided tumbler jar for a snug fit. Each box also fits inside our straight sided tumbler jar case box for convenient storage. Boxes are packaged flat for economic shipping. Slightly smaller in size to our classic tumbler box, these kraft boxes have a natural look and rustic charm suitable for any natural candle line. Looking for a lid? Try our silver, bronze, or black metal flat lids. We do not recommend using the metal flat lids with the straight sided tumbler box as they do not fit well together. Would be nice if the container fit with the lid inside the box. Box is nice if you’re not using the lid. These boxes would be perfect for the new taller straight sided tumbler if you do not plan on using the lid that is recommended- which I did. So now I am not sure what I will do. But they are super convenient. I like these boxes a lot. They work perfectly with the straight sided tumbler jars.